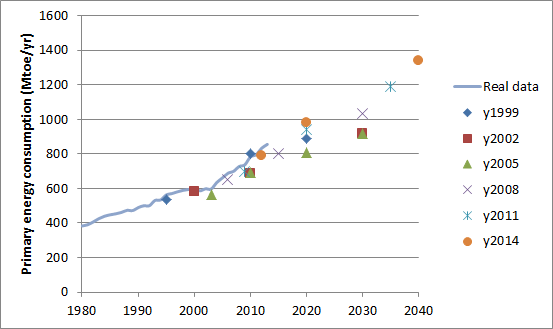 This article analyses historical IEA predictions of global energy consumption. 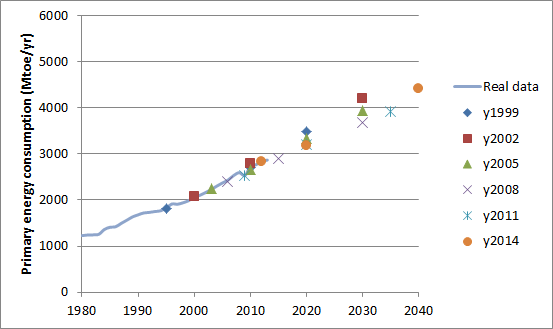 The International Energy Agency tackles a monumental task every year when compiling its World Energy Outlook report: forecasting global energy consumption over the next 2-3 decades. Over the years, the IEA has taken quite a lot of flack from critics with 20/20 hindsight about fairly large deviations between forecasted and actual numbers. For example, the IEA failed to forecast the plateau in conventional oil production which started about one decade ago and generally underpredicted the expansion rate of modern renewables. But just how large are these deviations? This article will take a quantitative look at 15 years of IEA World Energy Outlooks (available here) and compare the pr66edictions to actual data from the BP Statistical Review to get a clear picture. Each major energy category will be discussed separately. 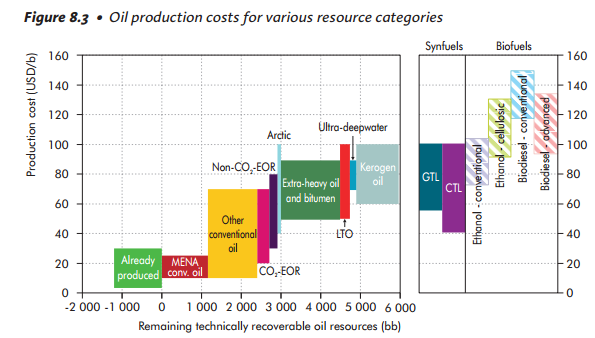 IEA oil forecasts for oil over the past 15 years are shown below. It is clear that the general trend is one of substantial demand overprediction due to the failure to foresee the conventional oil plateau which started in the previous decade. Recently though, the US shale revolution has led to a slight uptick in the demand outlook. The large drop in oil prices over the past few months confirm this sunnier outlook. Even though numerous commentators are now fearing another supply crunch due to insufficient exploration and instability in the Middle East, the fundamental fact remains that the world still has tremendous oil reserves which can be extracted at fairly low prices (see below). 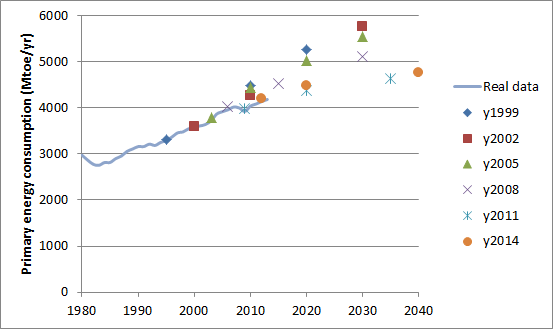 The graph below shows that the IEA has generally done a good job at forecasting gas consumption. Fracking has recently further contributed to security of supply, thereby increasing the chances of a steady expansion over coming decades. Despite receiving much less attention, the forecast error related to coal is substantially higher than that related to oil. 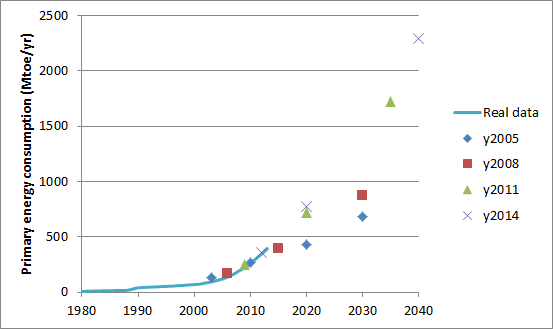 As shown in the graph below, the IEA completely missed the Chinese coal explosion following China’s inclusion into the World Trade Organization in 2001. The present outlook is for a marked slowdown in coal expansion, primarily due to developments in China related to pollution control, economic slowdown and a gradual shift away from energy intensive investment-driven growth. Unfortunately the fact remains that the world still has many poor countries that would gladly follow China’s rapid coal-fired investment-driven growth model. Ironically, strong consumer demand increases from China’s rapidly growing middle class will be one of the major drivers of coal consumption in poorer countries over coming decades. 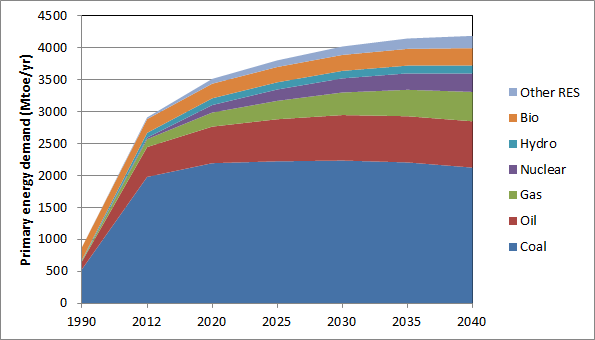 The IEA nuclear forecasts shown below paint an interesting picture. Even though recent data clearly points to a slowdown, recent forecasts are quite optimistic. The strong forecasted recovery in nuclear demand is again primarily attributed to China where nuclear is seen as an important wedge in the gradual reduction of coal’s dominance (below). China’s nuclear construction pipeline suggests that this should be a fairly accurate forecast. 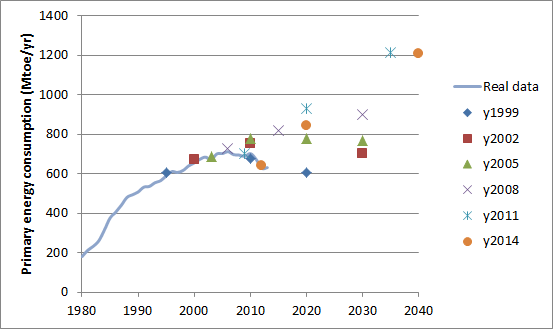 As shown below, the IEA’s hydropower forecasts have been reasonable, although the rapid expansion in China over recent years has also not been forecasted very accurately. This category consists primarily of wind, solar, geothermal and biofuels. 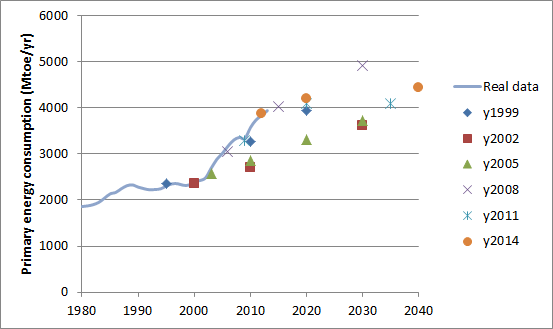 As shown below, the IEA has had to progressively increase its predictions over time as favourable policy environments stimulated faster than expected deployment and subsequent cost declines. As more information became available on the topic of modern renewables over the years, the IEA forecasts have gotten more consistent. For example, the forecasts for other renewables over the past three years are almost identical. It is clear from this analysis that IEA is unable to foresee events that deviate strongly from the norm such as peak conventional oil, rapid shifts in global trade flows and unexpected energy policy developments. It would certainly be much more convenient if the world would stick to the norm more regularly, but, because it doesn’t, IEA forecasts should always be seen in the right perspective. To summarize the forecasting challenges over the past decade, the difference between the 2020 forecasts from 2014 and 2004 are shown below. 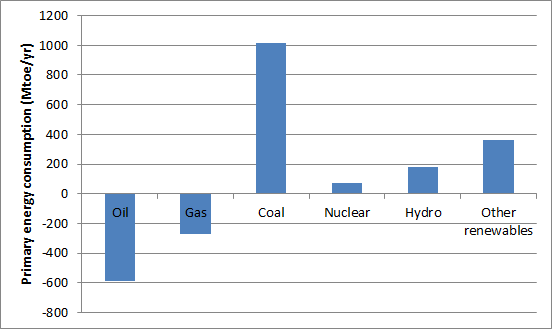 Oil, coal and renewables other then hydro have proven to be the most difficult to forecast. Oil will likely continue to be a challenge as unconventional oil sources increase market share and the Middle East remains unpredictable. Coal underpredictions are likely to continue as environmental pledges and hopes meet the reality of billions of poor people striving to increase their quality of life. For other renewables, however, forecast accuracy will likely increase in the future as technical understanding grows and policy support mechanisms meet hard economic limits. In the meantime, the unpredictability of global energy trends will give plenty of room for discussion and debate. In fact, the only forecast I can make with a good degree of certainty is that the topic of energy will only become more interesting over coming decades.